← Why is empowering low-information partisans bad, exactly? The Statesman’s review of the Austin economic climate is a much-needed profile and (to some extent) evaluation of the city’s economy. There are four areas where the Statesman’s coverage could improve. 1. Don’t forget about sub-group income levels. Not everybody is ‘OK’. 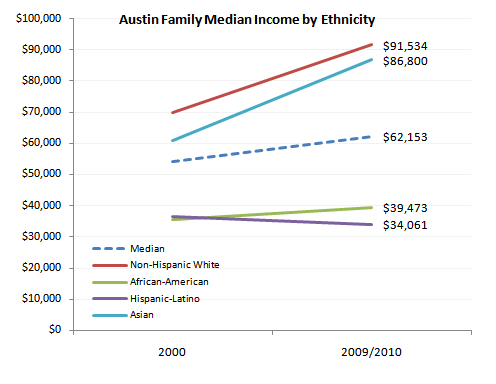 I often refer to the above chart as the most important overlooked chart in Austin policy and politics. Focusing on the city’s overall economic situation and rendering an ‘OK’ evaluation based simply on unemployment relative to other municipalities obscures the significant pain being experienced by sub-groups. Moreover, making it simply a question of unemployment rates also obscures the decline in wages. 2. Discuss policy choices. Policy nihilism conceals the possibility of making unemployment lower sooner. The coverage did not delve into policy options to reduce unemployment through municipal action. There are many potential policy choices from the left and right (e.g. have local public sector adopt a German kurzarbeit scheme, ease development regulations, undertake more capital projects and accelerate existing projects, etc.). The absence of a policy discussion might leave readers with an impression that the conventional wisdom dictates there’s nothing that can be done or worth discussing to ameliorate local unemployment in the short-term. 3. Focus on the value added (or destroyed) by policy makers on top of the City’s economic fundamentals. The Statesman’s article implies that there are certain aspects of the local economy – the location of the state public sector as well as the presence of technology companies – that help Austin outperform other communities. However, looking at relative levels can be misleading. As I have argued in the past, it’s better to focus on communities that share a narrow band of characteristics that make them quite similar to Austin. So, other state capitals with tech hubs in the Southwest would be more appropriate than nebulous comparisons to other cities. Visually, the newspaper could do a set of simple scatter plot visualizations to give readers a sense of how Austin performs given certain underlying characteristics. Said visualization approach replicates a multivariate analysis in a user-friendly way. My concern is that readers will walk away thinking that the existing policy mix is value-creating when a more statistically-sound evaluation might reveal that we are actually wasting the underlying trove of economic advantages we possess. 4. There is no forecast or ‘threat’ assessment. Toward its conclusion, the piece indicates that Austin has a positive ‘reputation’ that allows talent to be attracted. In my estimation, I believe this has to do with people thinking of Austin as a place with interesting cultural amenities, housing affordability relative to the coasts, quality public spaces, and dense urban land use. The article does not consider whether this important asset is likely to remain given the city’s existing land use decisions. The article does discuss the potential downside of public sector layoffs, but in general, it did not ask whether the underlying mix of industries and policies are best moving forward. I sincerely hope that the Statesman’s journalists will consider some of these suggestions as they continue with their important series. This entry was posted in Development, Economics and tagged austin, austin american statesman, economics, public policy, unemployment. Bookmark the permalink.